Allegedly reinstated Super Eagles coach Stephen Keshi reportedly spoke on the issue Thursday, October 30, after meeting with Nigeria’s Sports Minister Tammy Danagogo. Stephen Keshi Alleges There are Forces Aiming to Damage Super Eagles Ambition. Image: Getty. 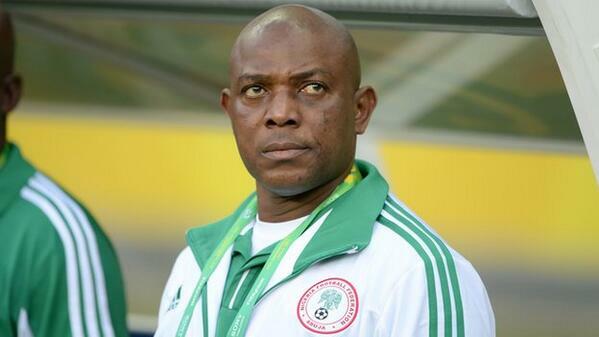 The news about Keshi’s return broke yesterday. Reports said that the former Eagles’ coach was to resume his duties and manage the national team in the November qualifiers for the 2015 African Cup of Nations (AFCON). It would be recalled that his contract expired in summer, and for the 4 played qualifiers Keshi worked on an interim basis, with the Nigeria Football Federation (NFF) considering whether to extend his contract or not. Eventually they decided to ask Shaibu Amodu, the former Super Eagles’ coach, to proceed with the remaining 2 AFCON qualifiers. It was reported yesterday however that presidency held the emergency meeting with NFF head Amaju Pinnick Wednesday night and strongly recommended the football body to reinstate Keshi. Reacting to the development, Keshi was said to have expressed his willingness to lead Super Eagles through the must-win November encounters with Congo and South Africa, Leadership reports. The allegedly returned coach made this known yesterday in Abuja after a brief meeting with the Minister of sports and Chairman National Sports Commission (NSC), Tammy Danagogo. He praised Jonathan for believing in him. It would be noted that the NFF and Stephen Keshi used to have tense relationships. One of the issues made public was that the coach had been paid his salary for months. And the football body accused Keshi of his reluctance to follow the rules and of choosing players not based on their performance, but based on his own preferences. It is worth mentioning however that there has been no official confirmation by the NFF about Keshi’s reinstatement at the position of the Super Eagles head coach. Teenage Striker Ibe Wants to Score More Goals For Liverpool.